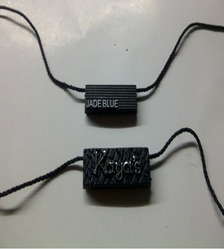 Plastic Seal Tags offered by us are used for brand identification in apparel, garments, watches, jewelry etc. The seal tags made of plastic and nylon rope on both sides, customized color size shape are acceptable, used for garment, bags, hats etc. Plastic Seal Tags for Readymade Garments & suitings, rubber labels, Metal Accessories, Button Badges, Plastic Hangers, Garment Accessories & Novelties. 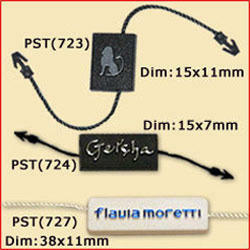 We offer a large assortment of molded plastic seal tags that easily fit into any garment and help in brand promotion. Available in custom designs, our plastic seal tags are made from superior quality plastic. These are molded into specific designs and patterns using die-casting or injection molding techniques. RFID Tags are rapidly replacing the Bar Codes and Optical Character Recognition type of Identification technology. SYRMA manufacture the tags with various technologies to suit the different environmental conditions. Our Epoxy Tags have been designed for high temperature applications like Industrial and Logistics Application. We make a wide range of Molded Plastic Seal Tags. These seal tags are widely used in various industries like garments, fashion, jewelry and watch industry for decoration and authenticity purpose. All samples shown are for reference purpose only. All logos and brands refer to their respective owners.